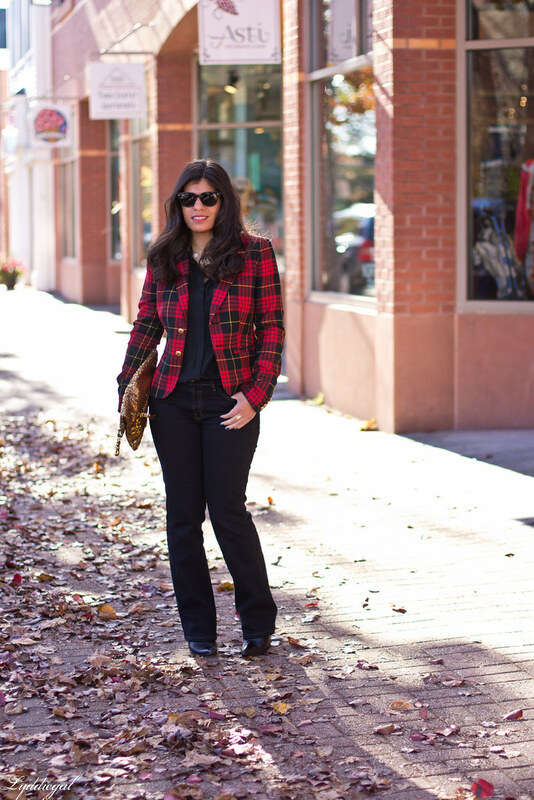 Everything plaid just screams fall. I feel like to took me too long to finally pull this blazer out of the closet - these jeans too! It's been months since I've worn either piece, and while we are digging out neglected pieces, this sequined clutch is far too under utilized. It isn't too often I want to forego practicality and carry a clutch during the day, however with the holiday season gearing up and my desire to add just a bit more sparkle to the look, I elected to use the sequined clutch. Structurally speaking, this clutch is amazing. It's got zippered compartments, interior pockets, exterior pockets, magnetic closures... If only it had a detachable strap, we'd be golden. 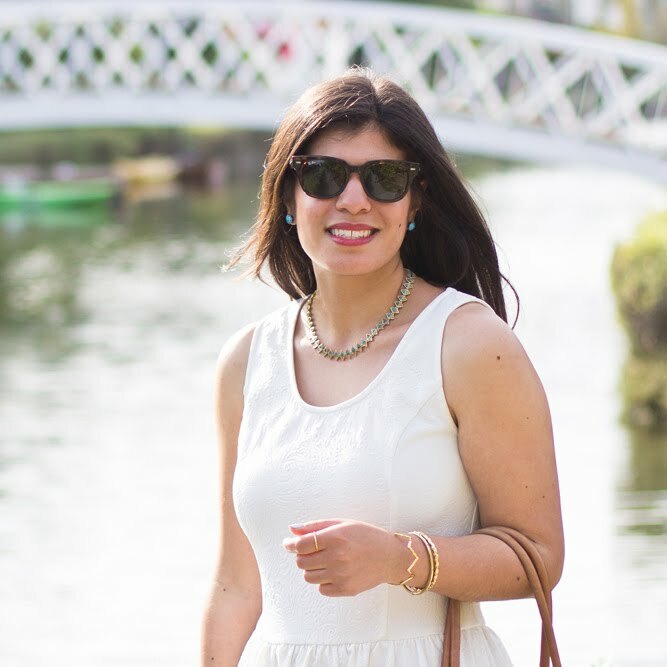 Have you entered to win a $400 Gift Card to Nordstrom yet? Such a festive look! 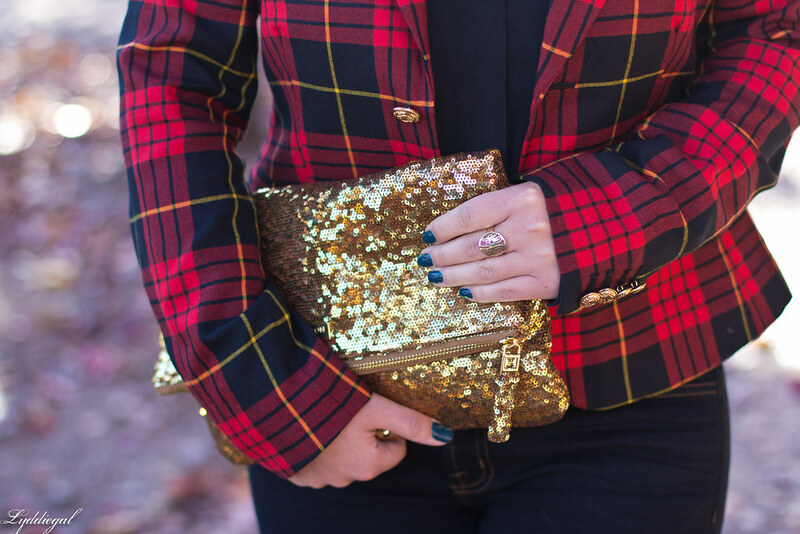 Love the glittery clutch with the plaid blazer. Oh love this classy and chic look. That clutch is amazing and looks so good with the plaid blazer. Love that blazer, it's so perfect for this time of year! And if for some reason I carry a clutch around one day, I find myself reaching for it again and again for about a week. There's something really nice about simplifying what you carry! That blazer and clutch are a seriously awesome combo. I really, really love the juxtaposition of plaid and gold! Wow! That blazer looks amazing on you! We are rockin similar clutches today :) Love the sequined look matched with plaid--so cute! Ba dum dum. Nice little pun! I love the gold and plaid! Very pretty and, obviously, very seasonal! Yes, clutches are so cute, but so NOT practical for everyday use. My favorites have a detachable strap! What a gorgeous plaid blazer, really is an added touch of sophistication to the look. The sequined clutch is a great pairing! 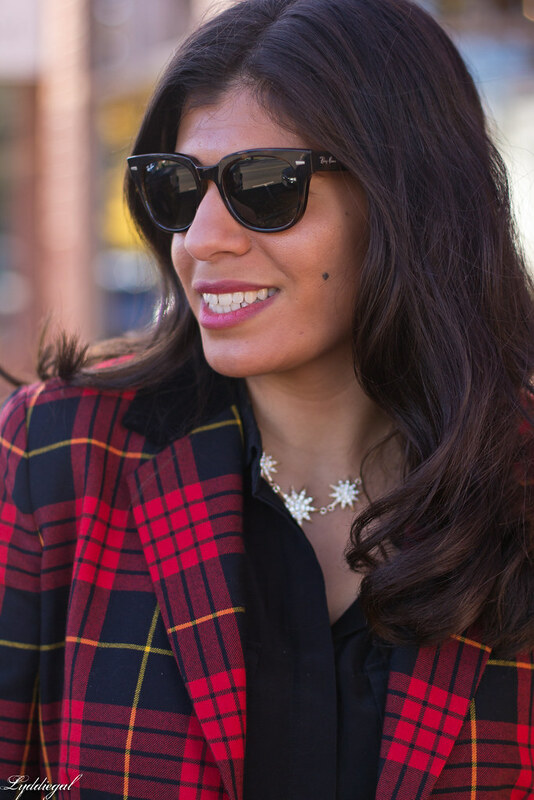 That is a great plaid print on the jacket and the little crystal necklace is so cute with it. I'm loving this plaid blazer!! SO perfect with your sequin clutch! Love the blazer and clutch. That gold clutch looks awesome with your blazer. What a great blazer! And I love that clutch. It's so perfect for the holidays! Super cute! Oh I love the bit of sparkle with the plaid - this is such a great combo! I love the plaid paired with gold clutch. I have caught the mad for plaid sickness and just can't get enough of it. Love this!! That clutch adds such a pretty, whimsical touch to the classic plaid blazer. Perfection. LOVE!! That blazer is fantastic. And the sequined clutch looks amazing with it. Beautiful and stylish as always! Great combo and amazing blazer! Your blazer is all kinds of amazing, love it! What a great mix of patterns, color and texture for the holidays! Good job using those underutilized pieces! Obsessing over the plaid and sequins! Gorgeous lady! It took me a long time to come around to carrying clutches at all, especially during the day - they just seem so impractical. But I finally got the perfect slim, flat wallet that allows me to carry everything I need in a very small space and now, I almost never carry anything but a clutch or a tiny crossbody bag. And it's actually a pretty amazing change. Although I don't have a gold clutch yet and, seeing this one, I think I need that to change. Love love love the jacket! 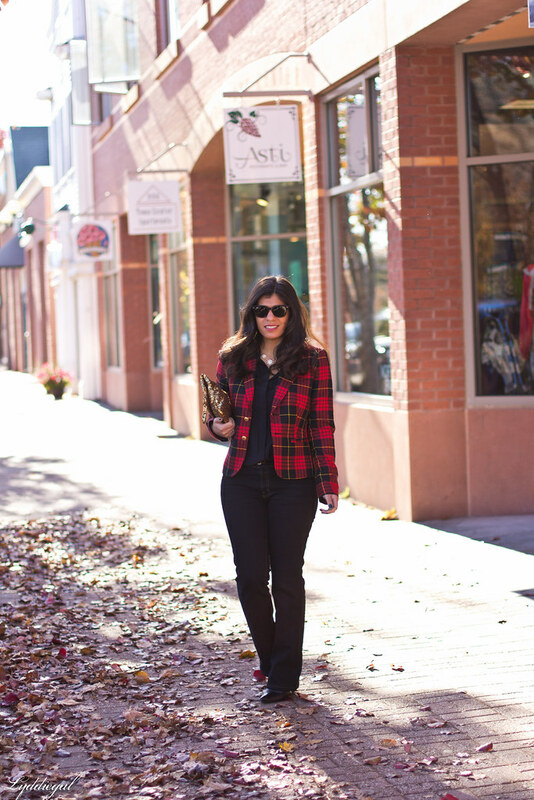 Tartan is a classic, and I love it on a good fitted blazer! Your clutch and blazer are gorgeous and both are perfect pieces to wear for the holidays. love that this outfit is preppy, classy and polished. love this plaid look! so cute! perfect for Fall! I love small bags, but if I have more on my agenda than cocktails, I need to have a strap! Nothing is more annoying than maneuvering a clutch under my arm when I'm actually trying to shop! That's a jacket I'd wear the live out of - or so I say.